In a world where it’s not always easy to get around, not everyone has cars and we’re all just trying to get where we need to go - services like Uber, Lyft and Taxi transportation are absolutely revered. While not every passenger will tip properly or treat you well as an Uber, Lyft or Taxi driver, our teams here at New Rochelle Toyota believe that you are an important part of our modern-day on-the-go society and we want to show you our appreciation for everything that you do. 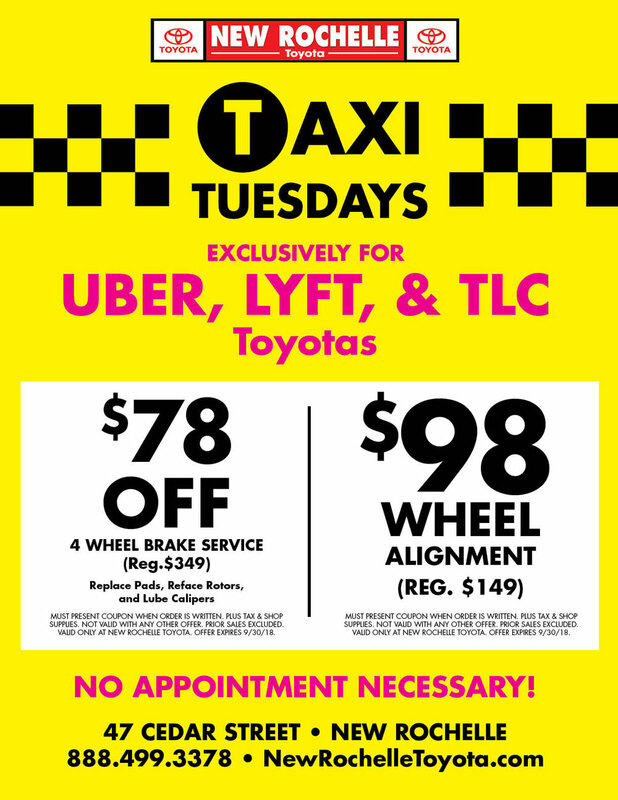 Every Tuesday, here at our full-service Toyota dealership, you can visit our dealership for discounted services for your Toyota vehicle if you are a driver for Uber, Lyft or TLC. We want to support you in making sure that your vehicle stays healthy and keeps running smoothly for as long as possible. So when you’re ready to give your Toyota what it needs and save at the same time, don’t hesitate to swing by our new and used dealership from Yonkers or Bronx, NY. You don’t need an appointment - just swing by! To learn more or if you have any questions, feel free to call us directly at 888-499-3378 or send us a message! We look forward to seeing you soon!